So, I've been on a Kingdom Hearts binge for the last week or so. I watched an LP of someone blindly playing through the games for the first time and BOY is it strangely entertaining. Normally it's not as fun to watch just anyone play KH because I would rather play it myself, but watching new people play and figure out the story is very interesting. Anyway, while I was doing this, something Mickey said at the end of Re:Coded lacked clarity, and I'm not sure it was addressed in DDD even though Xehanort knew. Does the 'light' side know that Ven's heart is in Sora as a fact? Mickey stated they were "closer to knowing where Ven's heart was", but he never outright said he was in Sora. Is it still just a theory for them, and a revelation that will be left for KH3? Or, is this something they've learned now but have yet to confirm aloud. At this point, the only way the "good guys" wouldn't know that Ven's heart is in Sora's is through sheer obliviousness. Aside from Re:Coded, Riku found Ven while he was walking around Sora's heart at the end of DDD. It doesn't take too much to piece together, and Riku's smart enough to figure stuff like that on his own... and he's not the type to just brush off usual stuff like that, unlike Sora. Something else to take into account with the line from Re:Coded is that lines sometimes get altered during localization, sometimes to the point where it significantly changes the line's specific message. Might be worth comparing the two lines and seeing if there's any differences. Yes, those are my thoughts exactly, but I had assumed they already confirmed it till I reheard what Mickey said. I'll find a japanese sub and see if there's a difference. It might not be out of the realm of possibility for them to exploit the fact that Riku never met Ven or seen his armor and just assumed Ven's armor was another humanoid nightmare like the one he fought before. But he had to have told Mickey and Yen Sid what happened and they could help him piece it all together. Maybe. I still wonder why they never questioned Roxas's appearance, but I guess technically, Mickey and Yen Sid never saw Roxas in person to piece that together sooner. Riku does meet Ven himself without armor inside the core of Sora's heart though during the question-scenario and only mistakes him for Roxas for about a second before realizing he is someone else. That is because those who know Ventus (Mickey and Yen Sid) never saw Roxas before Re: Coded. When Mickey and Data-Sora look into the painful memories that Naminé has found it is the very first time Mickey sees how Roxas actually looks like and that's why he later says to Yen Sid that he has now a clue towards the location of Ventus' heart, since it is obvious that Roxas, despite being Sora's Nobody, is at least appearance-wise heavily influenced by Ventus. It was right then that things clicked inside Mickey's head. Riku in DDD then actually seeing him inside Sora's heart should bring about the irrefutable proof about it if they weren't sure beforehand. Aha! I completely forgot that Riku spoke with everyone before he left Sora's heart. Though he didn't learn Ven's name, he had to have told Mickey and Yen Sid about it. Then, there should be no question that by the time KH3 rolls around, this should be information they all already know and will work to solve. The connection should be blatantly obvious to the characters in game. All that's left is finding his body in Castle Oblivion. If they even know it's there, or, if it's still there at all. or, if it's still there at all. Well, we know it's still there. We're shown it at the end of KH3D, and Aqua is the only one who can find the Chamber so there's no reason to think anything would happen to it at this point. The reason why I said that is because of the Birth by Sleep v.2 trailer. At the end, Sora disappears from the paopu tree and Ven disappears from his seat after a menacing shot of Xehanort turning around slowly. Maybe this will be explained in 2.8, but I assumed Sora disappeared because of what happened to him in DDD... I just don't understand the symbolism of why Ven disappears from the chair. I feel like it's implying something we won't know about until... well, either 2.8 or KH3. Don't think too much of it. Whatever was being foreshadowed in that scene was a concept that was dropped a long time ago. Kinda like the chasers all over again. Well, KH is certainly one of those stories where even such small easily overlooked visual-only clues play a significant role. In fact that is not all that is left. Finding Ven's body in Castle Oblivion is child's play once Yen Sid, Mickey and co. have recruited Aqua into their forces. DDD showed us that Ven's damaged heart certainly recuperated quite a degree over the eleven years it spend inside Sora so it might be ready to rejoin its body and properly awake Ventus as a full entity again, yet the crux of the whole thing is to transfer Ventus' heart from within Sora's heart back to its body without harming or damaging Sora in the process, something which neither Ven himself nor Aqua would be willing to allow, not to even speak of Riku and Kairi. Things like that are most often symbolic as in that case Ven "disappearing" was tied to Sora disappearing meaning that if Xehanort would really have got Sora's body as one of his vessels (which by extension means Sora's heart would be trapped in the abyss of dreams and thus Ven, Roxas and Xion would be trapped as well since their hearts are inside his), Ventus would have been lost for both sides of the conflict as only Aqua can reach his body in Castle Oblivion. However, if Sora's heart would be completely trapped and Ven's heart with it, there would be no reason for Aqua and the others to go to the Chamber of Waking to get Ven's body because it would be impossible to save him as long as Sora is still in Xehanort's hands. Hence Ven "disappearing" because in such a scenario none of his parts would play any role in the story as long as Sora's heart remains trapped. That too in addition to it being symbolic. Maybe it had something to do with the original planned ending of DDD that Nomura changed. It would be possible that it was originally intended for Xehanort to succeed at the end of DDD with the Prologue of KH 3 then being dedicated to get Sora back. who were the chasers again? Were those just the SoDs or something completely different? who were the chasers again? 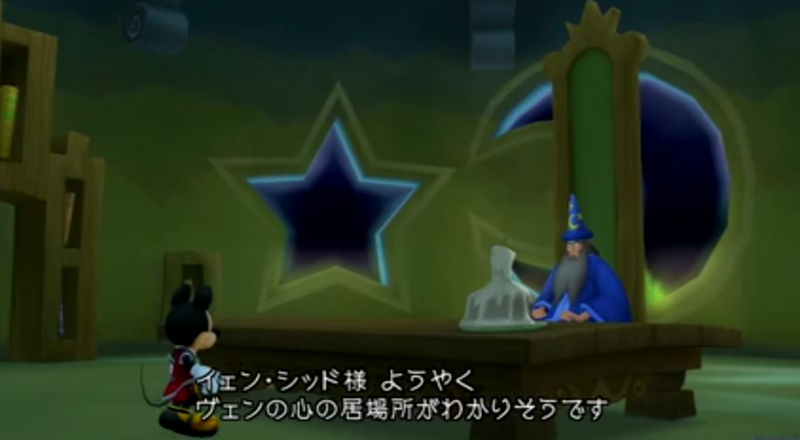 What type of proof could Riku bring back to confirm Mickey and Yen Sid's theories? "Inside Sora's heart, I saw Roxas and also a guy who looked just like Roxas but wasn't him." That's pretty much all they'd need? Mickey saw both Ventus and Roxas at the end of Re:Coded and would instantly know what that would mean.